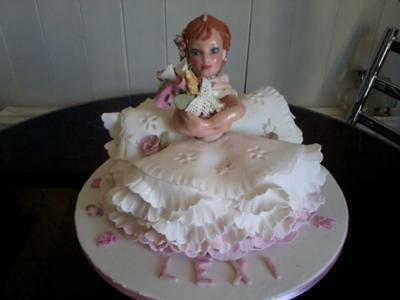 My friend asked me to make her daughter a ballerina cake. I wanted a pretty one here's how I did it: First I made the head, I had a doll with no hair so she made a perfect mold, I made the mold out of silicone. I filled the mold with sugarpaste and inserted a sugar stick for balance and left to dry for two weeks, I then painted on the face with food coloring. I made the hair by using a garlic press to shape the fondant and added edible pearls. I made two arms out of fondant then left to dry. when the head and arms were dry I shaped the body out of fondant and decorated it positioned arms and head and left to dry. I baked an eight inch madiera cake, I cut three diagonal v in the front and added them to the back of the cake to give it shape. I covered in buttercream, then fondant, I then used a garret frill cutter and attached frills around the bottom. I rolled out an eight inch circle for the top and placed over frills. I then placed the finished ballerina into the cake I made a bow out of fondant and placed at the back to support.